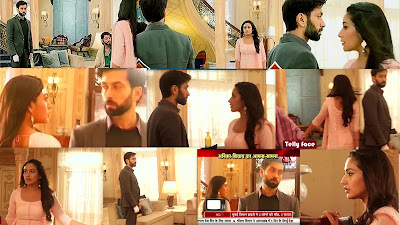 Anika-Shivaay's Milan and Eye Lock At Oberoi Mansion Ishqbaaaz SBB 28th June Video and Written Update. Segment Start with Anika’s Entry at Oberoi Mansion After She got Job at Oberoi Mansion. She Opens the Door and comes Inside to See Shivaay is Staring at her They have Eye Lock Anika is walking Towards Him and She Passes Through Him And Both Are Staring each-Other and Anika Passes Him. She Stops and Looks back and Feels Something She Puts Her Hand on Stair Railing Somehow She Stops her Feeling and comes To Search Her File and comes Inside the Shivaay’s Room. Anika tells her in interview that She Feels Some Strange connection with Shivaay’s Room and After that Shivaay came to Room and We have Moment. She Continues In Her Interview That When I enter in the House Dadi Told Everyone that Everything is Going well in our House like Lakshmi Came to Our House and That Time I Enterd in the House. She tells That We have No Conversation yet Everything is Going Silently But We Both feel So Connected to Each-Other Then That Eyelock When I reached to His Room. I feel So Similar Feeling Like I have been here Before. In Another Segment Priyanka is with Anika Too and She Leaves Anika With Shivaay and They Stare Each Other After that Same Scene Between Anika and Shivaay.